Digitises discharge printing to allow garment decorators compete in the fashion market. 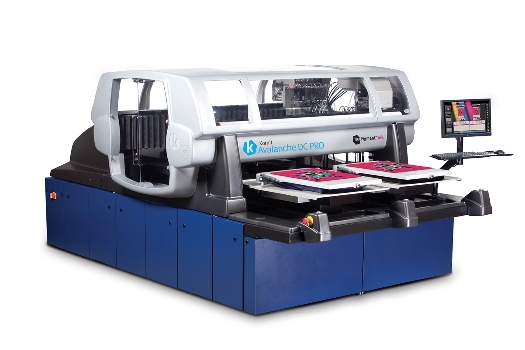 The Kornit Digital Avalanche DC Pro direct-to-garment printer Kornit Digital, a provider of digital textile printing solutions, has launched a new-generation discharge ink for the Kornit Avalanche DC Pro direct-to-garment printing system. This solution has been developed to create digitally printed garments which have a natural feel when touched. Kornit said that this is exactly what the fashion industry is looking for; enabling garment decorators to expand into new markets and achieve higher revenues and margins. The new discharge ink is an improved, ready to use version that does not require special handling or mixing, and remains stable in the print-heads for up to a year. The Kornit Avalanche DC Pro has two additional print-heads by which the new discharge ink is applied to bleach the dye molecules of the dark garment, providing a base for CMYK printing, creating a great natural feel for the finished product. In combination with the discharge ink, the system can apply flexible amounts of white ink for full opacity control. Support for the new ink will also be available as an upgrade kit for Kornit Avalanche systems with Spectra Nova heads. 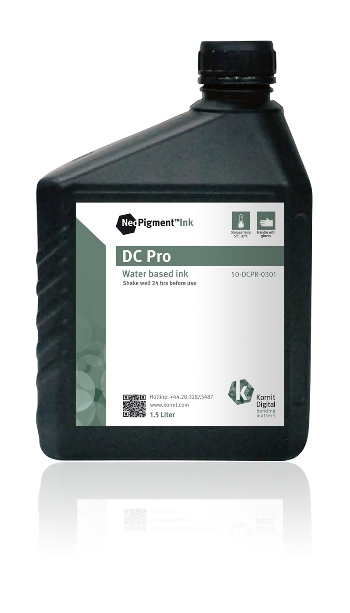 Kornit Digital’s DC Pro water based NeoPigment ink Kornit’s Avalanche DC Pro is billed as the only industrial solution that provides the user with an array of discharge and white options: it can print CMYK over discharge, CMYK over white, or CMYK over a discharge and white combination. Like all of Kornit’s direct-to-garment printing systems, the company maintains the Avalanche DC Pro features high productivity, combined with low printing and operating costs and the largest print area in the market at 60 x 90 cm. The Kornit Avalanche DC Pro has been specifically designed for garment decorators looking to utilise digital printing within the high fashion market.